Today Hugo and I hired a driver of a four-wheel drive truck (many thanks to the Muni for paying!) 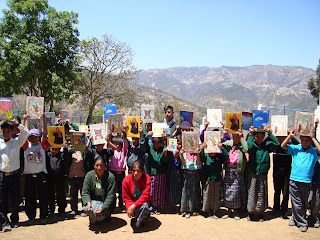 to take us out to the three of the communities that are participating in the mini-libraries project: Los Rojas, La Vega el Cerro and Buena Vista el Cerro. 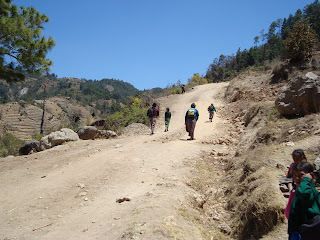 It was a bit of an ambitious trip, but we managed to visit all three schools and get back to the center by 2 pm. These schools, as previously mentioned, are extremely isolated. I had hiked to Los Rojas and Buena Vista in the past, and it takes 1 ½ and 2 ½ hours respectively to reach each one on foot. In car it takes about 45 minutes as the roads are horrible. Hugo made fun of me because I was so terrified driving down into Los Rojas, but I think anyone who was not accustomed to Guatemalan rural roads would be, and even the majority that are. A steep down hill road, which could hardly be considered a road at all, complete with sharp turns and drop offs the equivalent of cliffs… not something you want to be on if your brakes give out. La Vega is even further out, and takes a good hour and 15 minutes to reach it in car. I would guess at least three hours on foot. Our purpose was to meet with the parents of the community and discuss their responsibilities for the completion of the project. Many of them are already way ahead of us, as two of the schools had their bookshelves completed to show us upon our arrival. It was also an opportunity for them to ask us questions about the project. I shouldn’t have been shocked, but I was, when I learned that through this project many of the community members of La Vega learned for the first time what a library is. The education level in these communities is very low, so it is nice to see the parents showing such an interest. 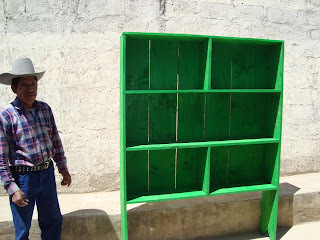 You could tell from the quality of the bookshelf that the parents made in La Vega that it is something very important to them. 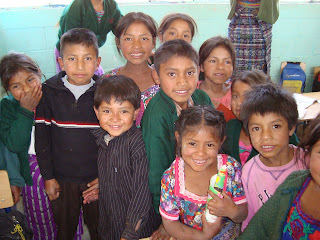 These communities are some of the poorest in Guatemala, which makes them some of the poorest in the entire world. We also took the opportunity to bring out some of the books that Child Aid had donated to give the communities an idea of what type of books they will be receiving in April. As things have been very busy the last three weeks with Feria, and Semana Santa is following in less than two weeks (both of these events mean a week off of school for students), we are holding off on the purchase of the remaining books until mid-April. The communities will be officially receiving their “mini-libraries” around April 22nd. 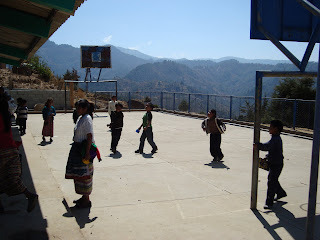 Tomorrow (with luck) we will visit the remaining schools of El Durazno, Quiquibaj and El Cebollin, before heading over to the neighboring municipality of Huitan to celebrate the opening of their community library. This means that we have to leave the center by no later that 7 am, and will hopefully be back by 5 pm. Sara, You are doing such a great job telling your story. Keep it up. I love reading it!